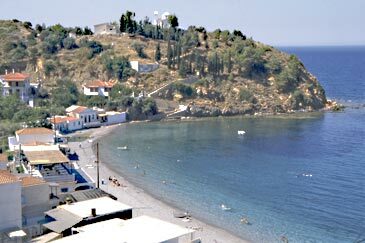 Chios is unique. To do it full justice you need a car, but it is also possible to split your stay between two places and use buses and the occasional taxi, especially if you are keen on walking or exploring locally on foot. 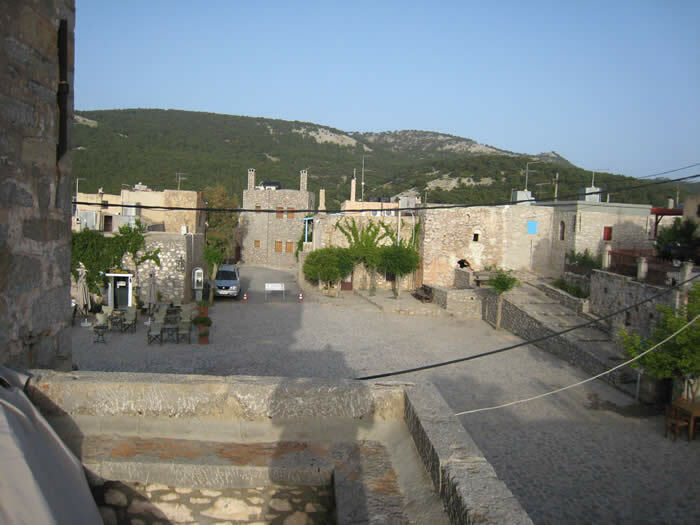 There are mediaeval villages with stone houses lining the narrow alleyways and squares hiding Arab-style souks; and it is famous for its mastic growing area in the south. The island can be appreciated in many ways: firstly for its grand scenery – mountains scarcely penetrable in the north and down the central spine. 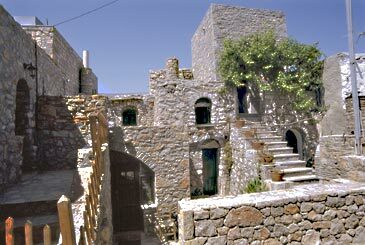 Secondly, for its history – villages like Pyrghi where every building is graced with intricate geometrical patterns; almost untouched villages of stone houses such as Avgonyma and Volissos; Genoese castles from the middle ages; rich trading settlements such as Mesta and Olympoi where souks from Ottoman days ooze Turkish atmosphere; and fine mosaics in the monastery of Nea Moni. 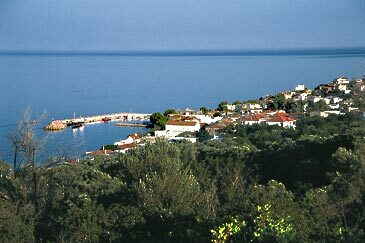 Lastly, Chios has the most prolific collection of wild orchids in Europe and is a rewarding island for bird watchers. 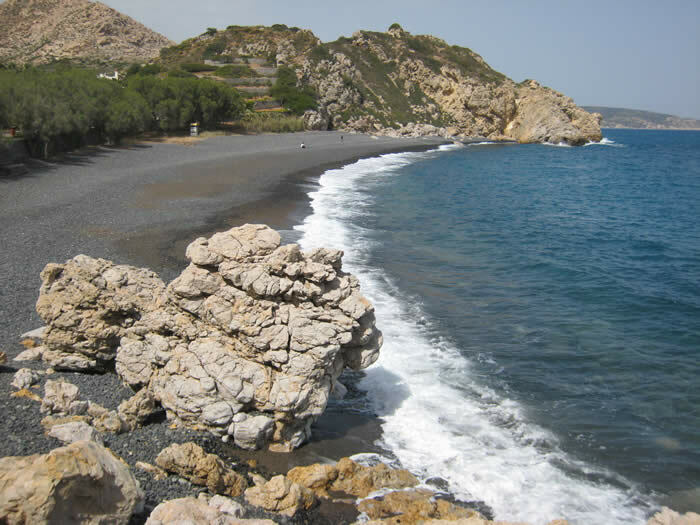 You will also find a profusion of excellent beaches and coves scattered almost all round the island, often nearly empty. You can cover the whole island from any of our bases but you may prefer to split your stay to minimise the driving. No charters – you fly scheduled from Heathrow, Gatwick or Manchester with a connecting flight in Athens (or possibly Salonica). 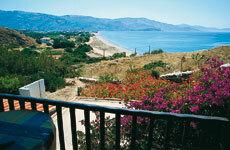 Primarily sightseeing, but great for walking, bird- and flower- watching as well as swimming and beaching. Daily ferries to Cesme just across the straits make a visit to Turkey easy. 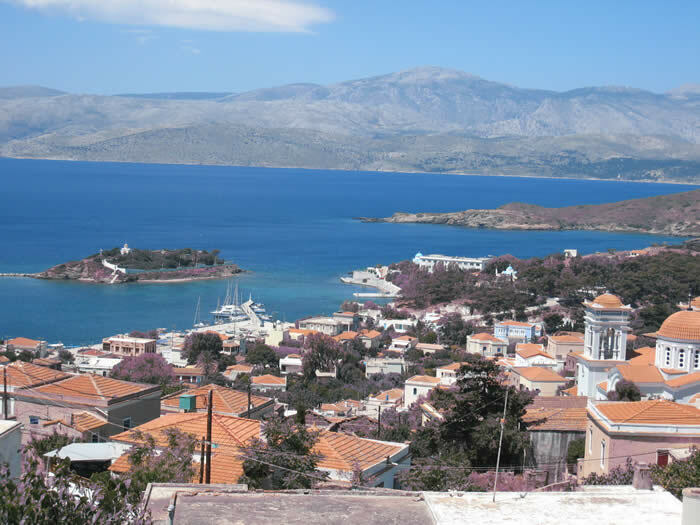 The lack of tourist over-development, the long stretches of beaches and the village beach resorts south of Karfas. 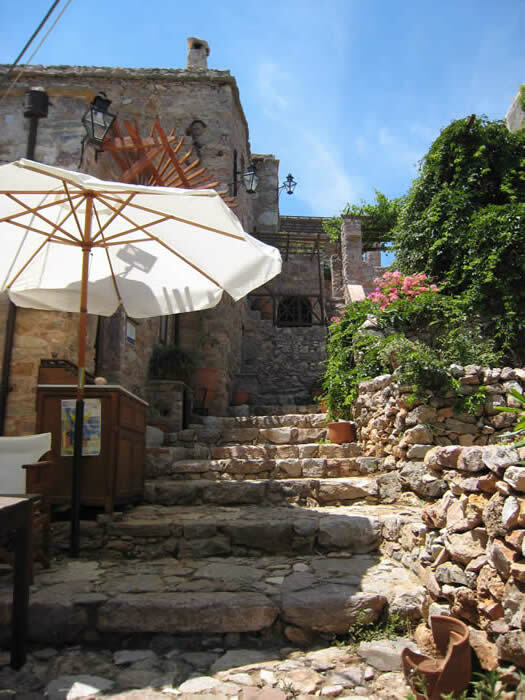 The mediaeval villages and the grand mountain flora and fauna. 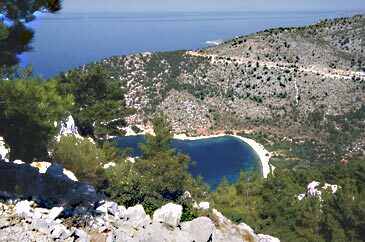 For utter tranquillity you probably can’t beat Inousses Island, just off Chios’s NE corner. 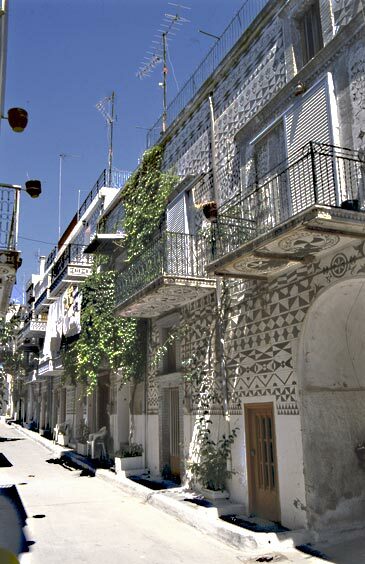 The capital, Chios Town, is not hugely rewarding: its water-front is a rat-run of noisy traffic, though the old Turkish quarter has some splendid architecture. 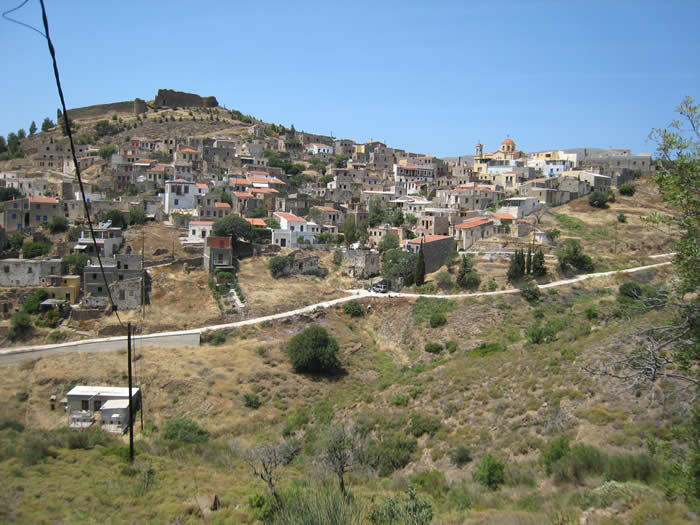 Volissos is amazing – an overgrown village whose narrow streets sweep up the steep hillside, culminating in a fortress at the top. Ano Kardamyla’s heart is a square shaded by gigantic plane trees - quite a contrast with the more modern Marmaro on the coast road below. If you venture down to the coast from here, don’t bother to look at Marmaro but continue north up the coast to Nagos (an enchanting little bay) or Giosonas (a more open and longer sandy beach). South from here are the waterfront tavernas of Langada with taxi-boats (at a price) to whisk you to Inousses. 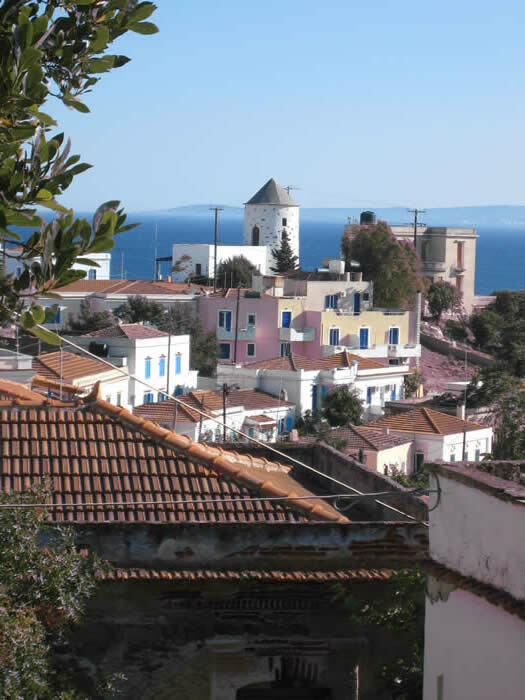 Avgonyma is a lovingly refurbished village of stone houses built round a square with gorgeous views of the nearby coast and the central mountain range. 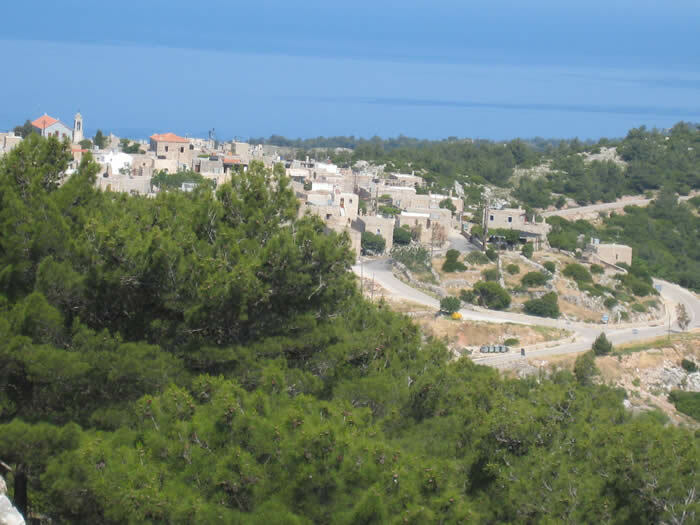 It is a short but curvy drive to the capital, whilst a steep descent the other way brings you to the west coast and a string of usually empty sandy bays; you are also within easy reach of Volissos. 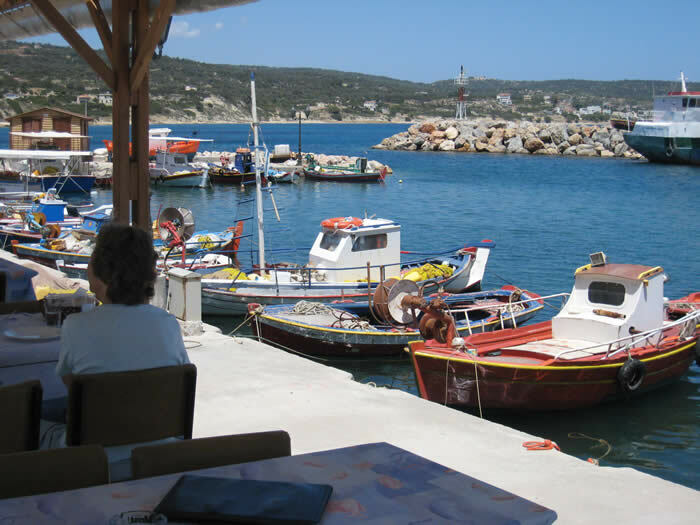 Katarraktis is a genuine working fishing village with harbour-front tavernas and plenty of local life. It barely pays lip service to tourism, having more important things to do; but it has character and quite a few shops tucked away in its narrow streets. It is an easy drive to the airport or to the beach resorts of the south-east. Our find of last year – an ambidextrous islet trying to decide whether to face Greece or Turkey. 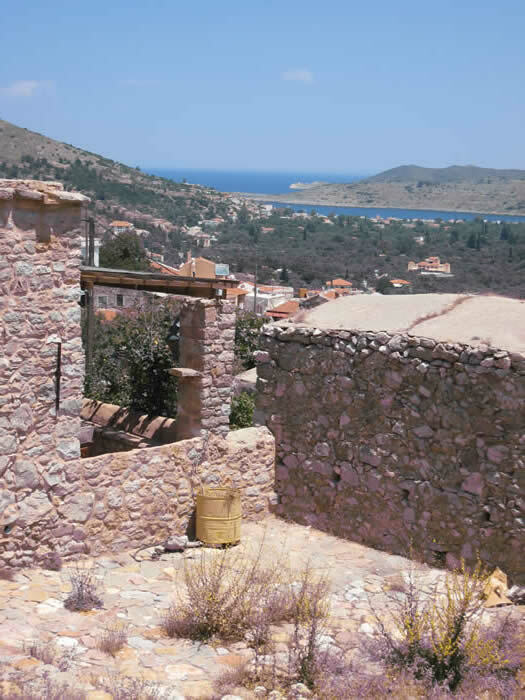 In fact it’s a true offspring of its parent island because, like Chios, it is home to many wealthy ship-owners who have built impressive houses here. Indeed, it appears to make even less effort to attract tourism than Chios – which of course is why it’s so nice, though our experience is that, once you are there, you are as welcome as anywhere else in Greece. Utterly relaxing, Inousses is a place where you can find a deserted sandy beach almost as easily as you can find a deserted church. There are a few tavernas and a restaurant or two. All local life, as well as impressive visiting yachts, can be viewed from the other side of a glass of ouzo on the harbour-front. You shouldn’t be risking a heart attack if you climb to the top of the hill for a 360-degree view – to the Turkish mainland near Cesme or to Greek Chios. Six studios with well tiled sh/wcs, simple kitchenette and twin beds on a raised platform; and two bigger studios with three single beds; all with big balconies facing sea and the sandy beach sweeping away south, a few steps down a path. Volissos centre five minutes' drive away. Simple refurbished cottages flanking the stepped main street of the upper part of the village with lovely panorama with glimpses of the sea. No 4 has big balcony and private amphitheatre for 100 people (no performances scheduled) outside the back door. 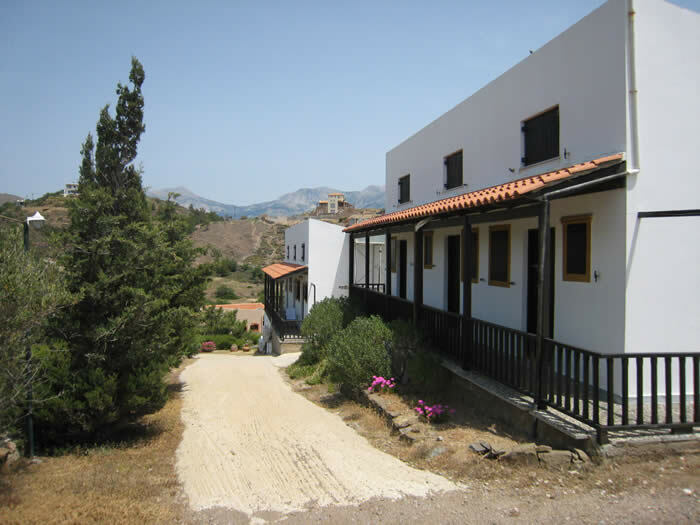 Four flats over two village tavernas (air-con) plus a row of cottages (fans) near the square. All different, all charmingly quirky, but comfortable and well equipped. 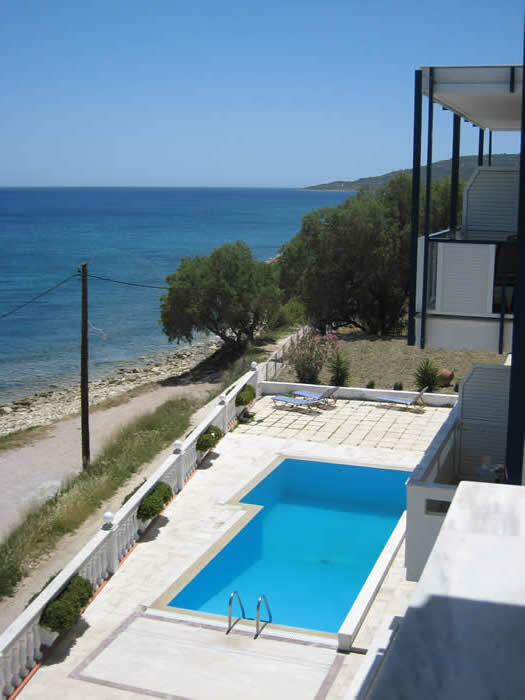 16 spacious studios and 4 apartments right on the sea, not five minutes' walk from the harbour front tavernas. 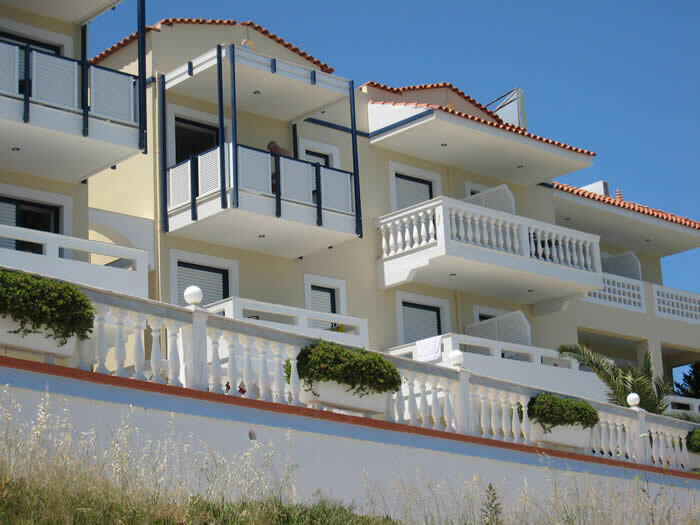 All units have full sea view from their large balconies. Attractive pool with sun-beds round it on the terrace. Apartments have kitchen/diner with two sofa beds. Overlooks a beach which is better for a quick swim than a whole day's picnic. Lovely views across to the Turkish coast. Cat A; tel, air-con; S/C 2-4 pers. 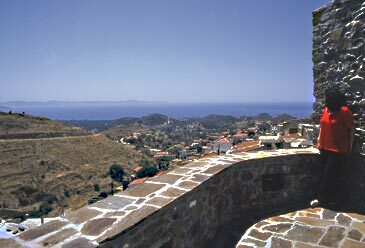 Refurbished (in parts) and run by charming friendly people, the Thalassoporos stands up in the old village with nice views from many of the rooms. The shops - decidedly unsophisticated - and the eating and drinking places are all within easy walking distance down wide steps and within puffing distance on the way back.